A large snake managed to escape a high school science lab in Fairfax County and was setting off motion detectors before police were able to wrangle the reptile back into its enclosure. WASHINGTON — School security officers responding to alarms at a Fairfax County high school made a ssssssscary discovery: A large snake had managed to escape the school science lab and was slithering around setting off motion detectors. The snake escape happened shortly after midnight Monday at Hayfield High School, in Alexandria, a Fairfax County police spokeswoman told WTOP. 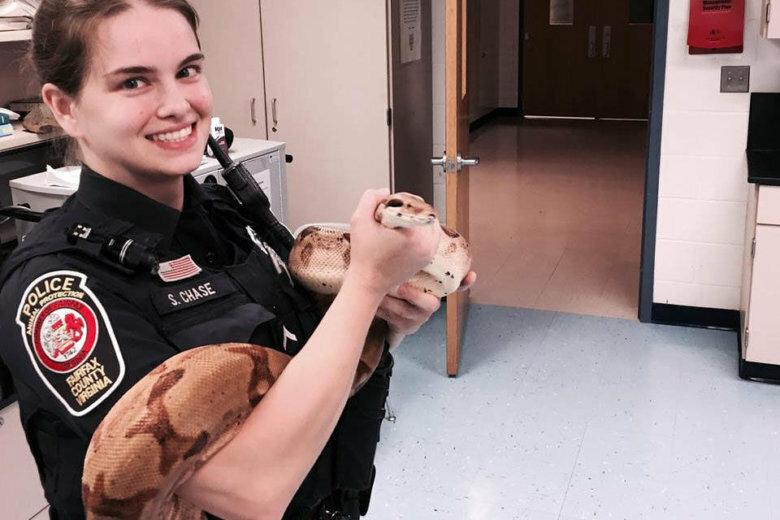 Animal Protection Officer Siobhan Chase was called in and was able to wrangle the reptile back into its enclosure ssssafe and ssssound. Fairfax County police shared a photo of Chase with the large snake — believed to be some kind of constrictor — wrapped around her arms. (This post has been updated to correct the location of Hayfield High School).